Back from a trip to Papua New Guinea, Cotton Grower Services’ market development manager, Reinder Prins, reflects on our nearest neighbour’s unique subsistence farming culture. I RECENTLY spent two weeks in the Central Highlands area of Papua New Guinea (PNG) on the Kokoda Track. The track is a narrow 60-mile path that runs straight through the Owen Stanley Range and it was the location of the 1942 World War II battle between the Japanese and (mainly) Australian forces. The main purpose of walking the track is to retrace the steps of the troops and get an idea of the conditions they had to battle, but also to meet the local people and see how they live today. Although the battle took place 75 years ago and circumstances and conditions were completely different for us than they were back in the day, local life in 2017 still seemed like a walk back in time for many of us. No electricity apart from some small solar panels to charge little radios, little bamboo shacks with no showers, toilets, or other facilities, and no official employment for most people, but rather living off subsistence agriculture combined with hunting and gathering, are only some examples of the stark differences we encountered. Whilst I was mainly looking to learn more about history and enjoy the track in general, the nine days of trekking also offered me plenty of opportunities to learn more about local agriculture from our guides and some of the locals I had a chat with. The main crops grown in the area where we passed through are corn, taro, sweet potato, and yam. 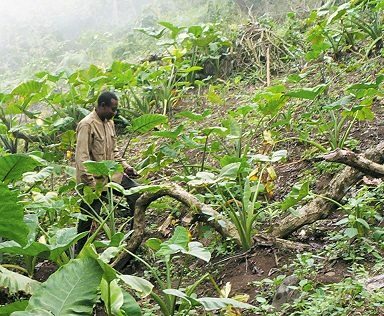 Cropping paddocks are created by fencing off a small parcel of forest, often on a steep hill, with a wooden fence construction to keep the wild pigs out. Then someone climbs up in the trees and lops the tops off so that only the trunks remain standing. The field is then burned so that the tops of the trees and whatever else is on the ground is turned into fertiliser and an “empty” field is created. Fields are not ploughed at all, no traction animals are used, and everything is done manually without any modern tools. What I found strangest about these cropping fields in Papua New Guinea is that these crops are often all grown as a seemingly random mix in the same field. However, in some spots you will see a lot of corn whereas other parts of the field have only sweet potato in them. When asked how they knew this, I found out that this was based on information that has been passed down through generations. Although this is not a scientific-based farming model, I found it very intriguing that, even without any modern equipment or calculation devices, the people of PNG have figured out their own form of precision farming. By knowing certain parameters of the field you are working on, you can work out which crops to plant and how dense to plant them. As I was trotting down the muddy track and mentally preparing to climb the next big hill, I realised that there might be something we can learn from these methods. Yes, we do have a lot of modern equipment at our disposal in Australia. And yes, we do have a lot of data available for the fields that we crop. But do we always sufficiently use the knowledge that we already have at our disposal through years and years of experience? Having equipment available for all kinds of measurements and utilizing the data sets from this equipment is often useful, but I think that this might also cause us to sometimes lose sight of what we already know. The Australian cotton industry (and I’m sure many other agricultural industries around the world) has a wealth of knowledge through research initiatives that have been going on for years, agronomists and farmers that have grown cotton for 30-plus years, and a plethora of other industry people. Can they be replaced from one day to the other by data sets, new equipment, and AI-based algorithms? New technology can be a fantastic tool to gain information that was previously not available, but my trip to PNG has taught me that even at the very basic level, farmers can make decisions that increase their profitability with whatever tools they might have available. I’m sure that one day the answer will be different, but right now it feels to me like the person who knows where to plant corn and where to plant sweet potatoes (or agronomists as we call them) shouldn’t be chased out of our village just yet. This article was first published on the Precision Agriculture website. 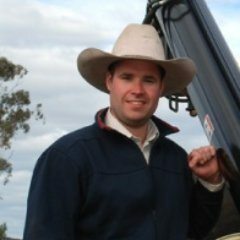 Reinder Prins is Cotton Grower Services’ market development manager at Wee Waa, NSW.